Prior to starting construction on the Futenma Replacement Facility (FRF) in Henoko, Nago City, the Okinawa Defense Bureau (ODB) conducted a dugong survey and confirmed the presence of three dugong specimens. Since construction in the ocean began the whereabouts of two of the specimens have become unclear, and as of February 2019 the only dugong whose whereabouts were confirmed was the specimen now found deceased. Although the ODB denies that construction affects the dugong, it is clear through the ODB’s surveys that construction is affecting the condition of their habitat. In August 2014 the ODB started setting up buoys and other equipment in the ocean, and conducting underwater boring surveys. Since then, dugong feeding trails have stopped appearing in the seaweed beds around Cape Henoko. 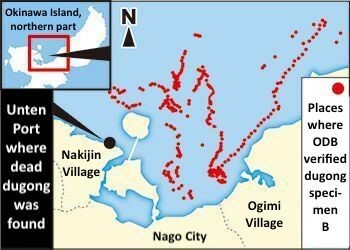 Dugong specimen C, who used to appear in the waters of nearby Kayo and was last spotted in June 2015, was reported after September 2018 to have moved to the waters around Kouri Island. Specimen A used to appear frequently in Kayo, but his whereabouts have been unknown since September 2018. There has been a decline in dugong feeding trails in the seagrass around Kayo since September 2018. At most there were a total of 120 dugong feeding trails in Henoko, Kayo, and Abu within one month. However, in December 2018 and January 2019 feeding trails were not found in any of these spots. Looking at the characteristics of the three dugong specimens as recorded by the ODB in its environmental impact assessments, the dugong specimen that was found dead had an indentation on the left side of its back that resembles the Japanese hiragana character “he.” This indicates that the dead dugong is the female specimen B, who is likely the mother of specimen C.